A variety of testimonies on life, justice and peace from around the world. The theme of the assembly was inspired by the diversity of Asian contexts and by a growing sense of urgency to care for life and seek justice. Please click on the titles of the reflections below to read a variety of testimonies on life, justice and peace from around the world. More videos are available on the WCC YouTube channel. Reflection by a group of laity, drawn from different churches and from different parts of India, who gathered in December 2012 at the invitation of the Board of Theological Education of the Senate of Serampore College. Poem written in response to the WCC 10th Assembly theme by Bishop Reuel Norman O. Marigza of the United Church of Christ in the Philippines at a meeting of Asian delegates to the assembly. A working group of 25 theologians and activists representing Dalits, Indigenous Peoples, the Ecumenical Disability Advocates Network, the Global Ecumenical Network on Migration and all those struggling against racism met in November 2012 to prepare reflections on the assembly theme from the viewpoint of those struggling against marginalization, rejection and discrimination. Representatives of Eastern and Oriental Orthodox WCC member churches met in October 2012 to reflect on the theme of the 10th WCC Assembly. More than 30 theologians from around the world, representing the Ao and Chang Naga, Aymara, Igorot, Maori, Maya, Mizo, Quecha, Santal, and Turtle Island, met at Yu-Shan Theological College and Seminary, Taiwan, in September 2012 to reflect on the assembly theme and discern what their theologies could contribute to the ecumenical movement. In his address to the WCC Central Committee meeting at the Orthodox Academy of Crete in September 2012, the Ecumenical Patriarch reflected on the assembly theme in light of the apostle Paul's letter to Titus. 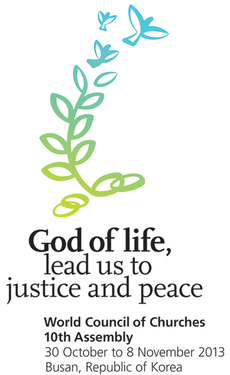 A reflection from an African perspective, shared during the opening prayer of the WCC Central Committee meeting 2012. Simon Dossou is the WCC president from Africa. A reflection from the perspective of an indigenous people threatened by climate change, shared during the opening prayer of the WCC Central Committee meeting 2012. Sofie Petersen was the first Inuit to be ordained a bishop in the Danish Lutheran church. A reflection inspired by a partnership being developed between DanChurchAid and the Myanmar Council of Churches, and shared during the morning prayer of a WCC Round Table meeting in May 2012.